Within the next two weeks, teachers and other NSTU member employees, including principals and vice-principals, will decide whether to proceed with job action. While the province and the NSTU are returning to the bargaining table, this does not stop the countdown period to job action. The NSTU will be in a legal strike position as early as Saturday, December 3rd. In practical terms, the earliest possible strike date is Monday, December 5th. We fully appreciate talk of any type of labor disruption can cause concern and uncertainty. The following information is being provided to update you on the current situation with the NSTU and to help you plan for your family should the NSTU decide to take job action. When can teachers go on strike? The earliest any job action can occur is Monday, December 5th. Will there be any advance notice? 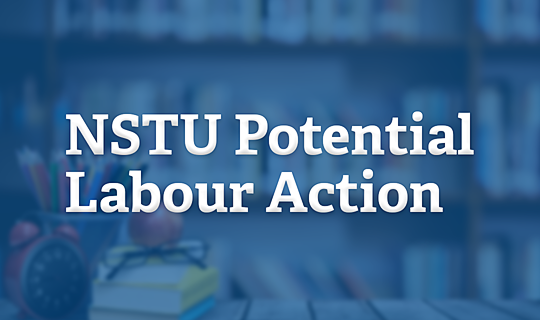 The NSTU must give the Minister of the Department of Labour and Advanced Education a minimum of 48 hours’ notice before any job action can occur. Job action may not happen immediately following the conclusion of the 48 hour time period. It may not happen at all. Will you know what type of job action the NSTU will take? The NSTU is not required to give notice of what kind of job action they will take. They are also not required to provide the specific date and time of when job action may occur. What type of job action can occur? Job action can take a variety of approaches. Some examples include a province-wide strike and a work-to-rule. Work-to-rule is when employees continue to work but refuse to do certain activities outside of their contractual job requirements. In the case of teachers, this can include no longer supporting extracurricular activities. If teachers strike, will schools close? If there is a full withdrawal of services, schools could close. We will be in a better position to answer this question in the coming weeks. It is important to make a plan to prepare for the possibility your child may be out of school. What will happen if teachers work-to-rule? There may be changes to student drop off and/or pick up times and changes to lunch time supervision. It is likely extra-curricular activities will be canceled. Other programs are expected to be impacted including after school programs. We will be in a better position to answer this question more specifically in the coming weeks. How will I know if my child’s school is impacted by a teacher strike, work-to-rule or any other form of job action? It is very important that students, parents and guardians carefully monitor their school boards’ communications through websites, Facebook, social media, handouts from school and through the regular media outlets. Your school boards will notify you as soon as they are made aware of any potential interruption in the school day. It is important to note that they may have short notice. Start planning for the possibility that your child may not be attending classes and/or before and after school activities after December 5. Your school board and the Department of Education and Early Childhood Development are working collaboratively to plan for any potential job action. We will continue to provide you with updates as the situation evolves and more specific information becomes available.